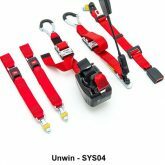 The combined system is a four point restraint system with a split reel double inertia passenger restraint for both safety and comfort. 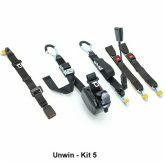 The occupant restraint is fitted with a reversible stalk that can rotate to fit either side of the vehicle. In accordance with international standards, Our occupant restraints are designed to be used for passengers weighing 22kg and above. If the passenger weighs less than 22kg, we recommend that a suitable, and appropriately compliant child restraint system is used.